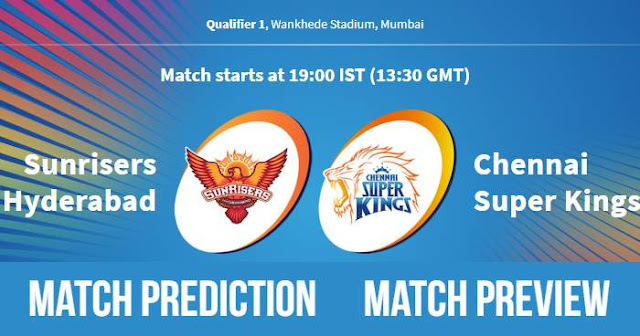 Home / Chennai Super Kings / IPL / IPL 11 / IPL 2018 / IPL 2018 Match Preview / Match Prediction / Mumbai / Sunrisers Hyderabad / Wankhede Stadium / IPL 2018 Qualifier 1 SRH vs CSK Match Prediction, Preview and Head to Head: Who Will Win? IPL 2018 Qualifier 1 SRH vs CSK Match Prediction, Preview and Head to Head: Who Will Win? Sunrisers Hyderabad (SRH) and Chennai Super Kings (CSK) will play the Qualifier 1 of the 11th season of Indian Premier League – IPL 2018 on 22nd May 2018 at Wankhede Stadium, Mumbai. As far as weather is concerned, it will be a hot and humid day, with the temperature around 30ºC and humidity around 70% during match hours. The wicket had even covering of cross; traditional Mumbai pitch with some pace and bounce. It will be good batting wicket little on the slower side. Under the lights, the pitch gets better. A high scoring match can be seen. Carlos Brathwaite got his first game in the last match against Kolkata Knight Riders but was unable to impress. Sunrisers may bring Alex Hales back in this crucial match as he has some match experience this season. Chennai Super Kings are most likely to bring Shane Watson in place of Faf du Plessis who will give an additional bowling option. Chennai Super Kings and Sunrisers Hyderabad had played 8 matches against each other head to head in IPL, out of which Chennai Super Kings have won 6 of them and Sunrisers Hyderabad have only won 2 matches. Chennai Super Kings have won 3 matches of the last 5 played between them, including 2 matches in this season. Chennai Super Kings and Sunrisers Hyderabad have never met in playoffs or at Wankhede Stadium, Mumbai. Sunrisers Hyderabad have played 5 matches at playoffs, out of which they won 3 matches. Chennai Super Kings have played 17 matches at playoffs and had won 10 matches and losing 7 matches. With dew coming into play later in the match, chasing becomes easy, so toss-winning captain would like to bowl first. 4 of the last 5 match have been a high scoring match with average 1st inning score of around 180. Another high scoring game can be seen here in the playoffs stage. Sunrisers Hyderabad finished the league stage at the top of the points table with 18 points. On the other hand, Chennai Super Kings finished the league stage with also 18 points; Net Run Rate was the deciding factor. Sunrisers Hyderabad have successively lost last three matches after winning 6 matches in a row. 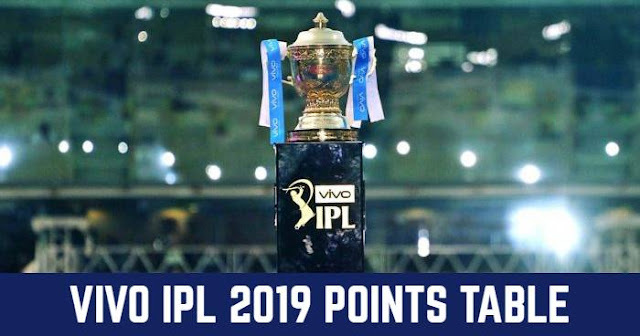 They are also up against the team who had defeated them twice in the tournament; this will be a psychological advantage for Chennai Super Kings. Sunrisers Hyderabad bowling unit is considered best in this season but their performance in last 4 matches are not up to the mark. Sunrisers bowlers have conceded totals of 187, 180, 218 and 173 – an overall economy rate of 9.64 in last 4 matches while their economy rate was 7.24 in their earlier 10 matches. In our prediction, Chennai Super Kings have an advantage in this match and are more likely to win this match. Toss: Chennai Super Kings won the toss and elected to field first.. Playing XI for SRH: Shikhar Dhawan, Shreevats Goswami (wk), Kane Williamson (c), Manish Pandey, Carlos Brathwaite, Shakib Al Hasan, Yusuf Pathan, Bhuvneshwar Kumar, Siddarth Kaul, Rashid Khan, Sandeep Sharma. Playing XI for CSK: Shane Watson, Ambati Rayudu, Suresh Raina, MS Dhoni (c & wk), Faf du Plessis, Dwayne Bravo, Ravindra Jadeja, Harbhajan Singh, Shardul Thakur, Deepak Chahar, Lungi Ngidi.